Colour scheme: tower unpainted but alternating red and white bands are produced by the natural colours of the granite. This is the main light still active at Sunderland although, technically, because it's on the north side of the mouth of the River Wear, it's actually in Roker. When I first saw this lighthouse my immediate impression was that it was in need of some tender loving care as it appeared that the paint job had either faded away to almost nothing or had been peeled off by years of wind and waves. In fact neither of these factors explains the slightly faded look - rather the tower itself is constructed of alternating bands of red and pink granite, the colour scheme being produced by the natural colour of the stone. The white painted lantern with its black dome displays a white flashing light visible for 23 miles. 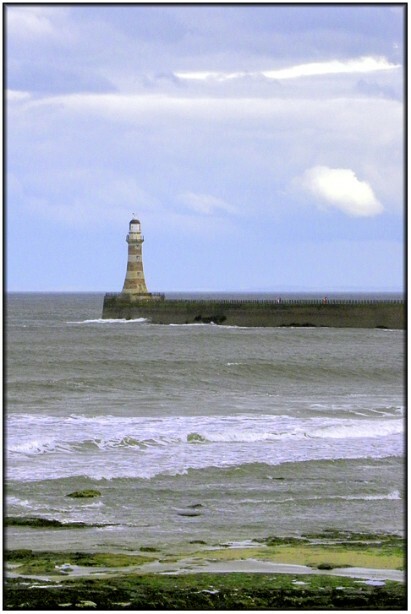 The light is owned and operated by Sunderland City Council who also own and operate the port. Access to the pier is not possible but there are a couple of spots from where photographs are possible. This one was taken from Cliff Park in Roker, but the car park on top of the National Glass Centre is another reasonably good viewpoint. For most of the locations on the north side of the river, the light is likely to be difficult until at least the mid afternoon.